Heroin is a tough drug. So what. If your community wants to implement a comprehensive set of solutions to heroin, start here. 1. How can we best compete with the cartels for the lives of people at risk? 2. What choice can we offer each person that is better than a life stuck on drugs? What Americans are facing, and the tools we have to respond. Heroin is an invasion and a plague. Drug cartels are “nonstate armed groups” -- just like ISIS or Al Qaeda. Cartels use people with economic vulnerabilities to sell drugs to people with health vulnerabilities. Drug use is spread socially. The drug supply is based on what is popular for the population in a region. The nature of the threat: Markets are becoming saturated. The death rate is driven by what the cartels put in the drug supply. Fentanyl, carfentanil are driving surges in drug deaths. EMTs must use higher doses of Naloxone, but Naloxone does not work on new synthetic nonopioid drugs. The solution involves rescue logic. The Coast Guard knows how to rescue people who refuse to take swimming lessons, who don’t wear life jackets, and who are too scared to jump into a net. The Coast Guard takes action even if the person has violated fishing or boating laws. Program model. Apply known epidemiological methods to opiates. Address threats throughout the population. Manage every case. Act assertively. Compete with the cartels for the lives of our people. 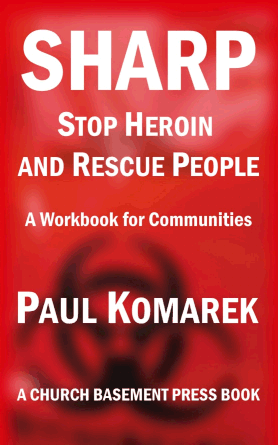 SHARP Stop Heroin and Rescue People. Law enforcement is “defense.” “Systematic rescue” is “offense.” Systematically attend to risk. Use all the elements of the clinical system, plus social support. This drives down the market for opiates, and restores people to families and to productivity. Milestones and Infrastructure Model. Eight milestones mark the pathway to recovery. (1) Enrollment in a medical system. (2) Overdose First Aid (3) Safe from Infection (4) Medicine, Not Street Drugs (5) Social Support (6) Rehab (7) Sober Living (8) Ongoing Recovery. Each community must deliver a continuous and supportive experience along this pathway, with no gaps. Clinical Playbook. Integrated care model to address specific risks of population and the specific risks of opiate use. The people at risk have co-occurring issues, such as mental health disorders, addiction issues, criminal thinking, suicide risk, pain, trauma, and developmental issues. Trauma-informed path to healing helps people find safety, reckon with what happened, and rejoin the larger community. The playbook has been reviewed by close to 100 doctors and experts. How to scale up. Add banking system resources to philanthropic and government funding. Target missing elements in local/regional systems. Show the banking system how to fund clinical startups. Use Community Reinvestment Act funds. The addiction treatment economy is about $35 billion per year. Community Reinvestment Act lending is about $228 billion annually. Solutions to Heroin in each region. Use Public-Private Partnership (“P3”) model to plan and implement system expansion. Track data and manage quality. $10 million in Community Reinvestment Act startup capital loans with A/R factoring. $100 thousand in gov’t, philanthropic grants. Local planners apply the Solutions to Heroin clinical playbook. Local planners and banks issue RFPs for missing system elements. Start services that are insurance-covered, Medicare-covered, Medicaid-covered. Advantages. Multiplies funding by a factor of 10. Startups are inherently sustainable, like any other healthcare. Creates thousands of jobs. Fixes longstanding behavioral health service system disconnects and gaps. Helps every service system adapt. Rescues people, saves resources, integrates care. "This is an all-society epidemic, and we have to face it together." The United States loses 175 people every day to overdose. Communities and healthcare systems are not responding to this epidemic fast enough. They have no way to fill gaps in local systems of care. SOLUTIONS TO HEROIN fully addresses this situation. It consists of three elements: (1) a clinical playbook that sets standards for local systems of care; (2) a public-private partnership model to support investment in necessary infrastructure; and (3) a funding model that uses private-sector bank loans for startup capital. This combination of program elements has the power to expedite formation of new treatment entities and build complete functional treatment systems in every community. The project utilizes Community Reinvestment Act and Small Business Administration funding to multiply the impact of government and philanthropic grants.The addiction treatment economy is about $35 billion per year. Community Reinvestment Act lending is about $228 billion annually. Get the book behind the plan. SHARP Stop Heroin and Rescue People is the first coherent response to the heroin epidemic. Based on today's best research and over a year of field work in Cincinnati and Northern Kentucky, the epicenter of today's heroin epidemic. It's the first book focused on delivering solutions to heroin for people seeking recovery, family members, people who work in community service systems, and all the rest of us. ﻿Copyright 2014-2017 Human Intervention LLC.